A few years back, through mutual friends, I met an interesting couple. They were both died-in-the-wool, card-carrying Disney Geeks. Both absolutely loved the classic Disney animated movies and the Disney theme parks. They first met at Disneyland in California, carried on their courtship there, and held their wedding right at the park. By the time I met them, they were living near Walt Disney World in Florida, had their first child, a little boy who is about three now, and had carved out for themselves a joint Dream Job: They have built a cottage industry around their Disney fandom. They spend almost all their time at the Florida Disney parks, and research and write free-lance articles about everything Disney for publication. They have a major Disney-themed website that brings in income also. My Facebook feed includes family chit-chat from them, mostly covering the latest adorable thing their cute little one has done at a Disney park. By the time most little kids are three, you may notice them in the back seat of the car on the way to the store spontaneously breaking out into the lyrics of the latest ad jingle for McDonald’s or some breakfast cereal they heard on TV. Not this little one. He breaks out into… the COMPLETE narration for the Catastrophe Canyon attraction at Disney Hollywood Studios! He’s been on the ride so many times that he has just “internalized” the patter of the guide. I’m sure he can do this for multiple rides and attractions. 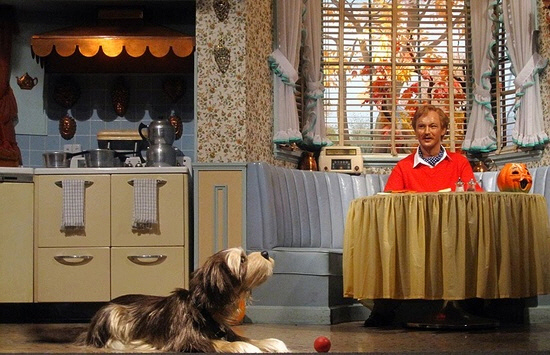 For each Disney attraction has a “narrative” that plays out exactly the same every time. 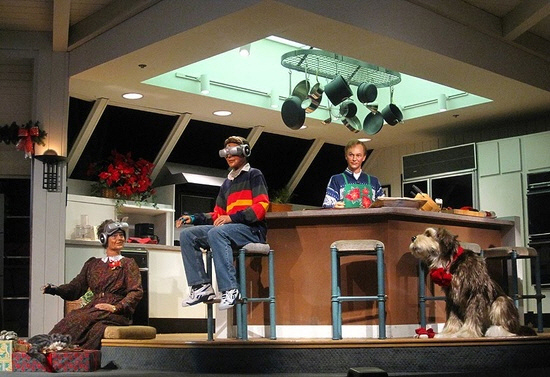 If you go to the Carousel of Progress at Magic Kingdom, you will see a typical American Dad, who is going to talk about the never-ending improvements that electricity has provided to the lifestyle of the average American since the turn of the last century. 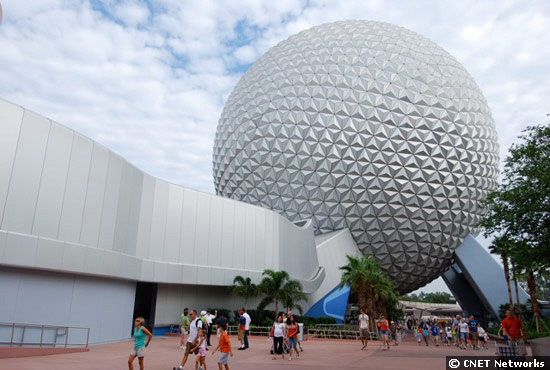 This is because the attraction was originally created for the 1964 World’s Fair in New York, paid for by General Electric as an “infotainment” attraction promoting its electrical appliances. 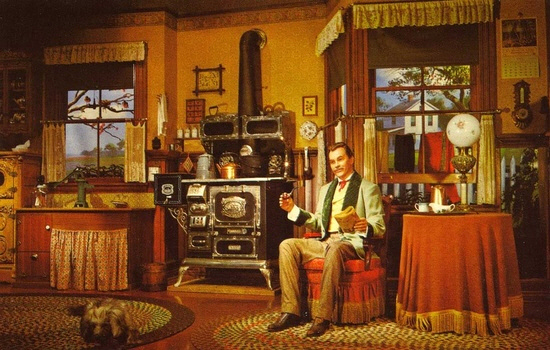 The audio-animatronic Dad has his standard patter that he does in each scene of the attraction, followed by belting out the tune to the attraction’s theme song—“There’s a Great Big Beautiful Tomorrow”—as the audience seating room revolves around the center stage to encounter the same Dad in his ever-improving electrical home. As you continue on around the stage’s pie-shaped sections to other eras, you hear a super-abbreviated narrative about the ways that electricity has made the American Dream of ultimate home convenience come true. I say all that to say this … it’s a “closed narrative.” If you visit the attraction over a period of years, you will hear the same thing every time. 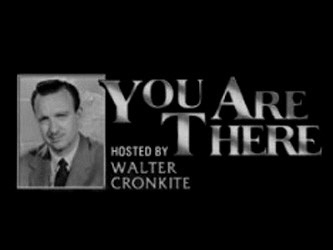 You will not go there and suddenly encounter a scene outside the ideal home where 1900s Dad lives. 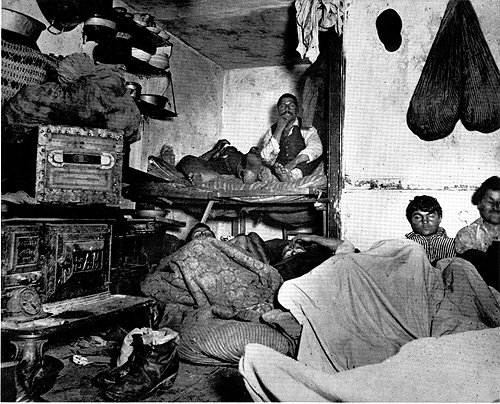 There will never be a hint, for instance, of what “modern living” was like for the millions in the slums of New York and other American cities in 1900. 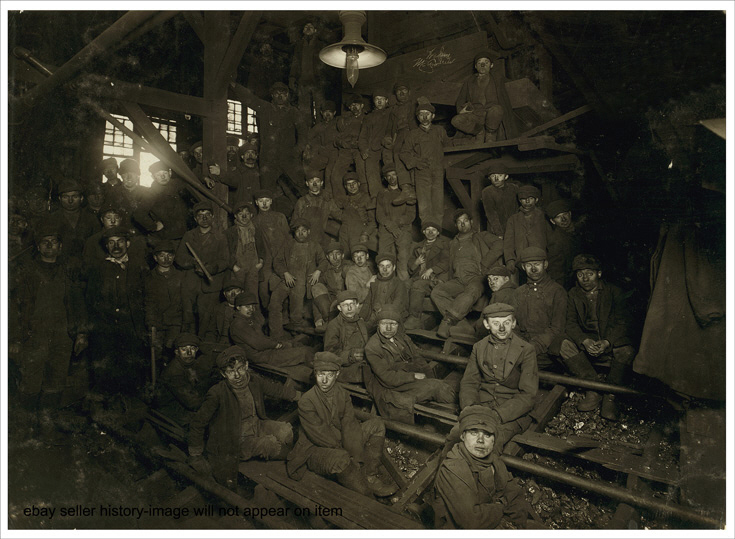 There will never be a peek inside the dark coal mines where horribly dangerous and abusive child labor is allowing cheap prices for the coal that fires the electrical plants of the time to power the conveniences of Dad and his family. No, it’s a bright, colorful, neat, tidy, cheerful little closed narrative that allows the viewer to join Dad in singing praises for the Great Big Beautiful Tomorrow that “all Americans” have always enjoyed. Now mind you, I’m not complaining! I love the Disney parks, and the Disney attractions. I expect to hear and see the same thing every time I go in a certain attraction. 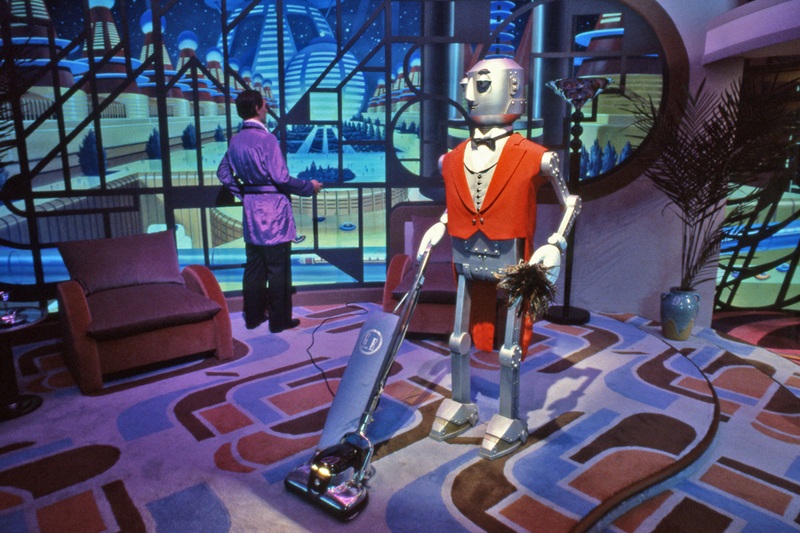 Like many geeky Disney park fans, I’m irritated when they retire one of my favorite attractions, like Horizons at EPCOT, that was discontinued in 1999. 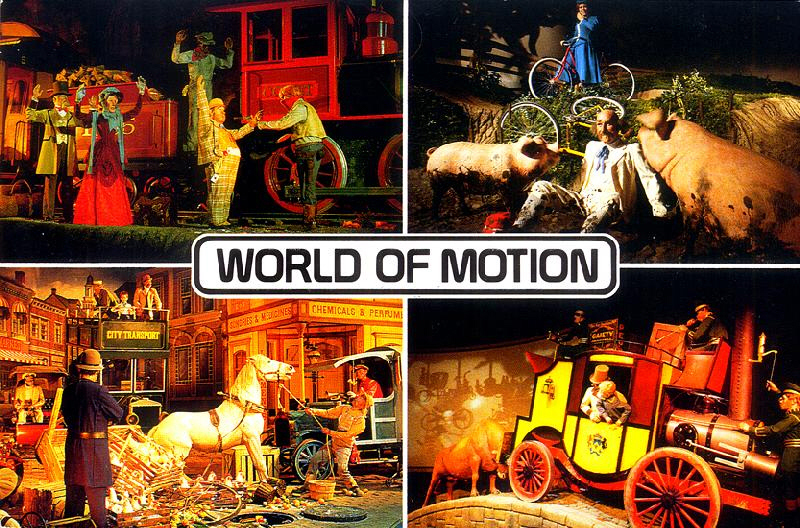 Or World of Motion, that was retired in 1996. I even balk at them tinkering with scenes or narration in attractions. 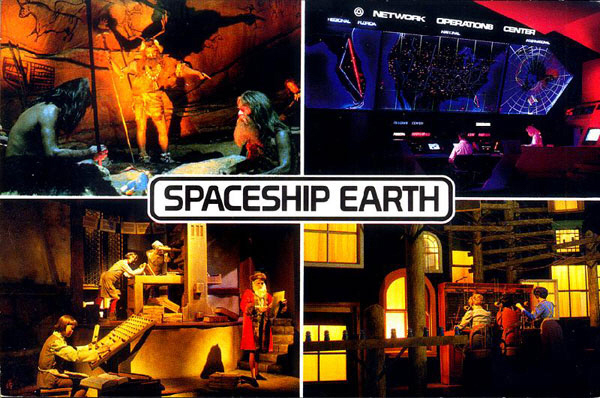 I was shocked—shocked I say!—when they pulled the authoritative voice of Walter Cronkite from its job guiding me through the Spaceship Earth depiction of the history of communication, and replaced it with a totally unfamiliar voice. I like to become familiar with the narrative…and then keep it permanently! Yes, I don’t mind that the audio-animatronic white-washed version of history at the Disney parks plays out to a closed narrative. But I AM concerned that it seems “real” history out in the “real” world is mostly treated the same way. I am convinced that what almost everyone does… me included, in the past… with what they learn about American history over the early years of their life is subconsciously construct a cohesive “narrative,” that very early becomes set in concrete. It starts with their earliest memories of historic tidbits in kindergarten such as making “handprint turkey” pictures to go along with the Indian feather headdresses and Pilgrim hats that they make out of construction paper for the class Thanksgiving Play and luncheon. 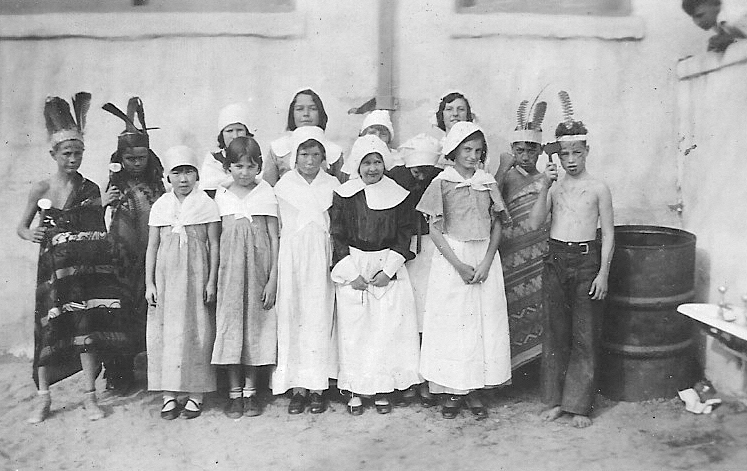 Santa Ana, CA, Franklin Elementary School in 1931. 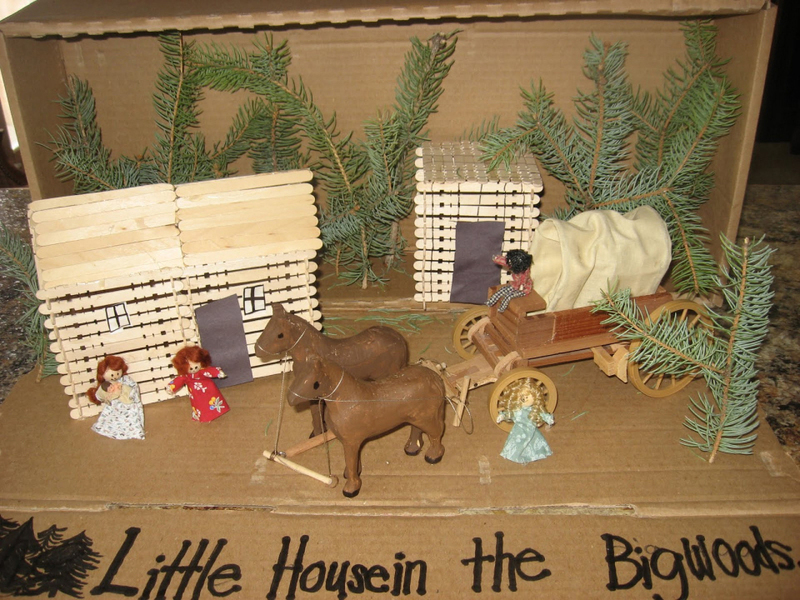 It continues as they read simplified stories in their grade school American history textbooks that skim rapidly over the “high points” of “how our country grew.” They may make little Pioneer dioramas with Conestoga Wagons, and read Little House books. And do projects to help them remember the names and order of the Presidents. 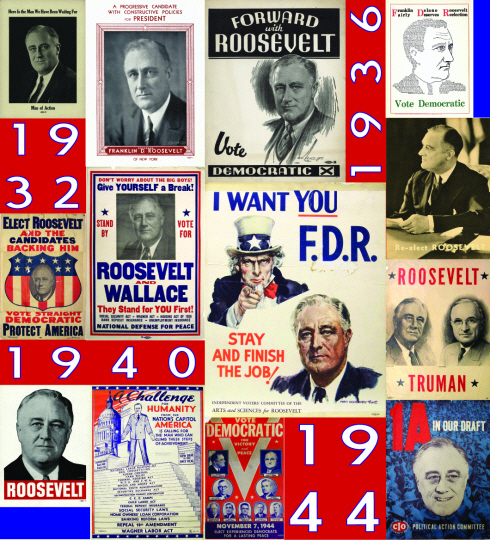 Woven into all of this is an underlying current of a set of Ideals expressed in our early founding documents, and in such later pronouncements as FDR’s Four Freedoms—Life, liberty, the pursuit of happiness, equality, the brotherhood of man, freedom from want and fear, freedom of speech and religion. And among it all, the notion that Americans have all been “free to be all that they could be” throughout our history. (Well, at least after the slaves were set free in 1865.) That all it took was strong desire and hard work, and, why, any shoeshine boy might become a titan of industry! This closed narrative that we each create in our subconscious, and the snippets of events that go into its construction, is reinforced for most of us throughout our lives by what you might call Civic Public Relations. Popularized Patriotism. 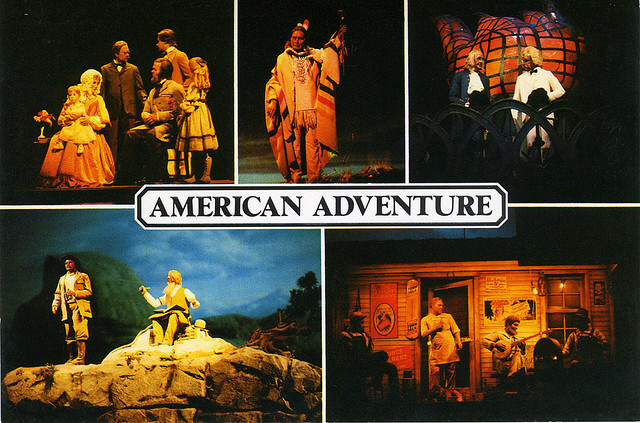 You see it in the attraction “American Aventure” at EPCOT. 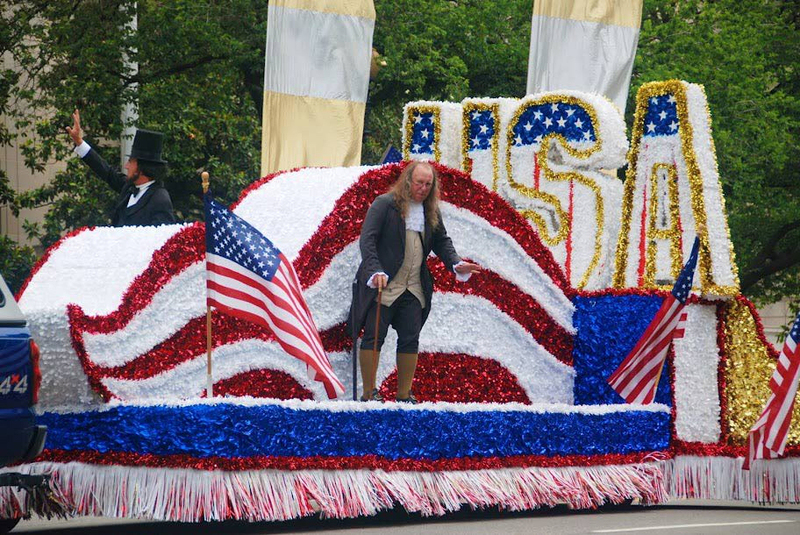 You see it on floats in Fourth of July parades. 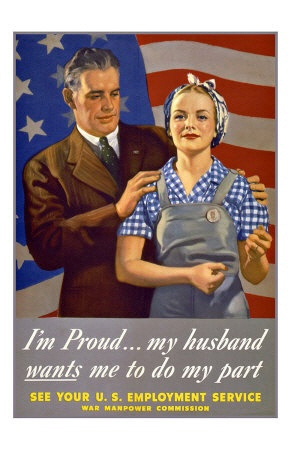 If you were around in WW2 you were utterly inundated with patriotic government posters. 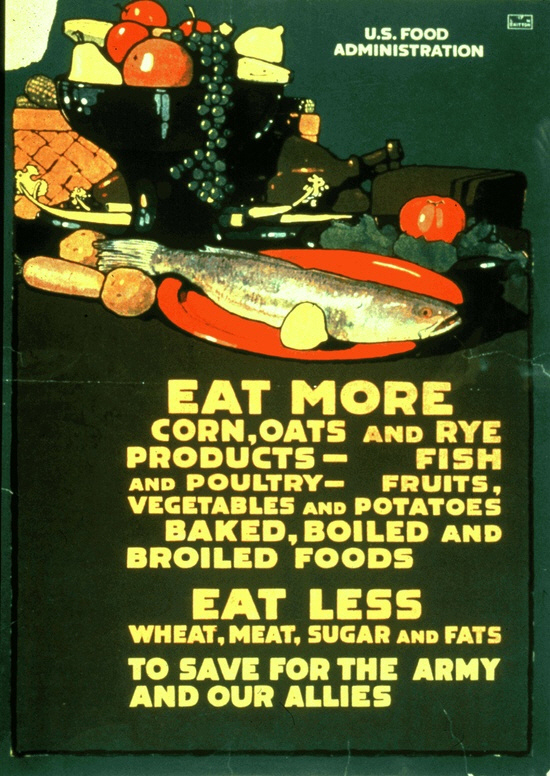 I even collect (digitally) the old WW1 and WW2 patriotic/propaganda posters and get all misty as I see the stirring messages on them designed to rally the American populace to sacrifice. But in recent years I’ve come to understand that TRUE patriotism does not consist of feelings of pride for everything my country has ever done. It doesn’t consist of a desire to sweep under the carpet all the unpleasant truths about the less noble things that have been done. My feelings of patriotism, of love of my country, doesn’t rely on me creating an artificial, stunted, closed narrative. My own personal extended family has had all sorts of good guys and bad guys in it. A comprehensive picture album of all of its history would include moments of triumph and moments of ignominy. It didn’t quit being my family when “bad stuff happened.” But neither would I gain any more “love” of my family if I would be able to fool myself that it had nothing but good and glory in its history. What I would do if I tried that would be to lose the integrity and honesty that makes me who I am. 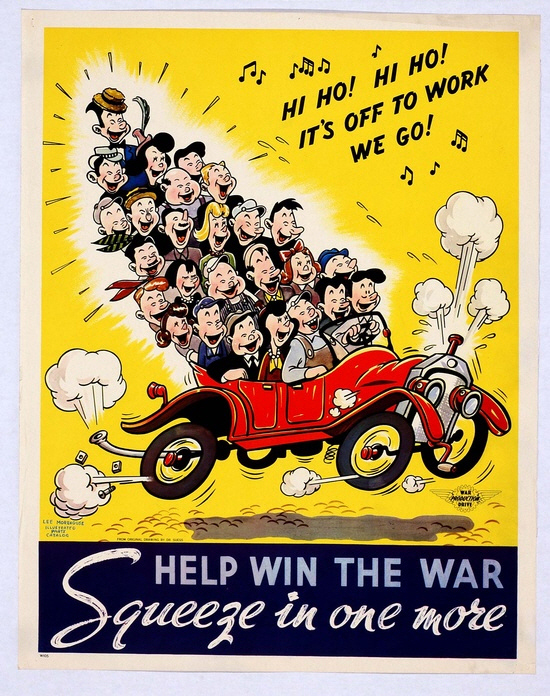 …museum exhibits, magazine articles, even pop music songs… like “Battle of New Orleans” by Johnny Horton! 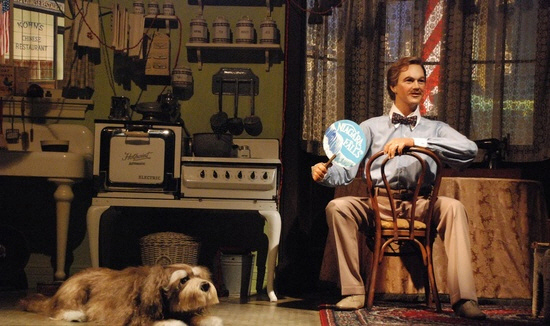 I bought into, essentially, an “American mythology.” It was a closed narrative about an America that never really was, outside of on Main Street in Disneyland and WDW Magic Kingdom. And it had given me a warped interpretation about what is going on in America today. It also gave me a warped perspective on facing any information that I ran across that conflicted with my mythology. This is where the concept of “cognitive dissonance” comes into play. (For a detailed explanation of this psychological theory see the material on my Field Guide to the Wild World of Religion website on the topic.) Basically, this theory explains that when we try to hold two opposing concepts in our mind…when a piece of evidence conflicts with an assumption we have accepted…we experience “dissonance” in our brain. A jangling feeling that something isn’t quite right. It makes us uncomfortable, and we do whatever is necessary to make it stop. Because our “Prime Directive” is usually to hold on to all of our long-held assumptions, most folks have a couple of main solutions they usually rely on to deal with Cognitive Dissonance. We can “discount” the new information and literally cast it aside, refusing to consider it any more. Or, if we are unable to do that because of some outside pressure forcing us to look at it, we can “make it over” …carving off pieces of it, reshaping it, until it will fit into our assumption system. Very seldom are people willing to reconsider and make changes directly to one of their assumption systems…whether it is the one about their religious beliefs, about their political beliefs, or any other topic they hold near and dear. This is either too painful…or too much work. But there is another solution, and I think it is one that many American citizens who pride themselves on their level of patriotism use when confronted with very unpleasant information about a factor in American History. They quarantine it. 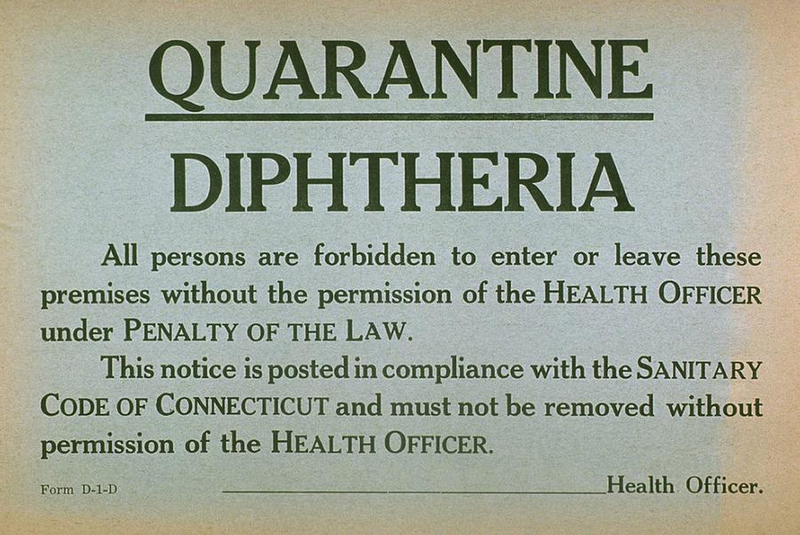 We don’t see quarantine used much any longer in our everyday life. But back in the 1940s and before it was quite common to walk along a neighborhood street and see a sign like this on a window or door of a home. The idea was that most of the neighborhood was disease-free. When one person cropped up with a disease, you could take that one person who had the problem and isolate them until they either recovered … or died… from the disease. And everyone else would be just fine. I believe this may well be how there could have been so much hubbub in the public press around the year 2000 about the Tulsa Riot, and yet a decade later it has gone back into the shadows. I’m pretty sure that if even I had seen one of the History Channel or BBC specials about it, I would have looked at it in fascination—but would have considered it a “historical fluke.” A single, isolated incident of inexplicable violence—horrific, and fascinating in its details. But unrelated to my own “personal narrative” of the history of America. Oh, I knew about slavery, but that was stopped at the end of the Civil War. I just “assumed” that from then on black people had lots of options in America. Well, yes, from a quite early age I had come to discover that lots of white people were “prejudiced” against black people, especially in the South. I knew they didn’t want to drink out of the same drinking fountain, and insisted that they be segregated into their own schools. But that was all. It seemed unfair to me, but it was just “the way things were.” Since I grew up in a town in far north Michigan that didn’t even have a single black family, considering the state of racial relations in our country just wasn’t something that came up in daily life. Ever. Not only regarding race relations in the past, but in the present. Until the Civil Rights movement of the 1960s came to national attention in the news because of riots and marches and such, I was pretty much blissfully unaware of the reality of what it REALLY meant to be a “person of color” in America throughout our post-Civil-War history. By then I had my “narrative” very strongly established. Whatever was going on in Selma or Birmingham seemed to me as a teenager to be just some “current event,” based on some current grievances in limited sections of the country. And I am convinced that’s how most outsiders may look at the story of the Tulsa Riot/Holocaust of 1921 when they hear of it. They admit it was awful. They declare that the white people involved were cruel. But they blithely assume it was a single event, in a single city in the US, during a single 24 hour period. An anomaly, not a symptom. And one that happened long ago. So it doesn’t really affect the narratives inside most people’s heads about the Land of the Free, the land where everyone has had, ever since the Civil War at least, the right to Life, Liberty, and the Pursuit of Happiness. And if anyone tried to interfere with those rights, the Good People of America would Put a Stop to It posthaste. So I’m suspicious that the average American watching a documentary on the History Channel of that infamous day would very quickly “quarantine” the event in their mind. It was a totally unexpected “outbreak” of craziness that was inexplicable. It didn’t connect in any significant way with the flow of America’s history—it was just an isolated incident. 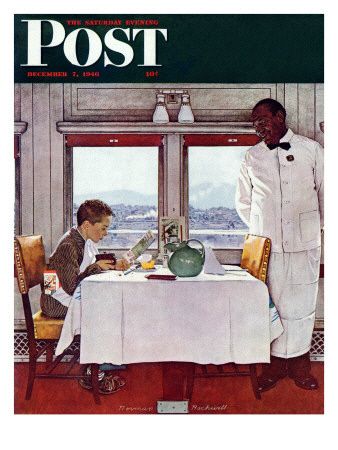 Those bad people of Tulsa didn’t reflect on “America” of the time…it was still the America of Norman Rockwell’s Saturday Evening Post covers. Uh, yeah …Covers that never, ever portrayed a black person, except in a subservient position, clear up into the 1960s. By decree of the publisher. It was a symptom of a plague that was already raging. It wasn’t unique at all. (It was just a bigger outbreak than usual.) And the plague didn’t stop with it at all. And the after effects of that plague still exist to this day. But few are paying any attention, because they are looking at all the wrong symptoms. To paraphrase Maya Angelou: Our history, despite its wrenching pain, cannot be unlived; but, if faced with courage, it need not be lived again. No matter what else we may do, we will not be whole unless and until we own our past, process it, and integrate its lessons into our present and our vision for the future. Teaching and learning are essential to this process. So, so true. This quote needs to be on billboards all over the city of Tulsa. They had a number of hopes for their efforts. They really did have hope that the government of the city of Tulsa and the State of Oklahoma would realize that MAYBE the few living survivors of the Tulsa Holocaust might merit at least a tiny bit of “reparations,” just a token of the regrets of the community—since, after all, there had been a huge outpouring of civic financial generosity—in the millions of dollars—related to the Oklahoma City bombing. It wouldn’t have cost much to extend such a token. But no, too many in positions of authority decided ANY reparations of any kind might set an unwanted precedent among others with grievances from the past. The number of survivors has no doubt decreased drastically since that time. A baby born that year would now be 92. Any adults would be in their 100s. It would seem that to just extend a hand to the handful left would be a noble deed. But no, it appears that it is not to be, and that all the survivors will just quietly die off. The authorities have offered a few crumbs of “good will.” Some metal plaques have been installed on sidewalks in the Greenwood area where riot events occurred. (In a black area, where few whites ever go to this day.) A “reconciliation park” has been created connected to a new semi-pro ball park in Tulsa. Although I’m not sure that most people who just go there for a nice picnic connect its existence to an effort at reconciliation between whites and blacks in Tulsa. Especially since most blacks in Tulsa STILL live “across the tracks” in the old Greenwood area, which has been rebuilt—but with none of the pride of its glory days. One of the only homes remaining in the Greenwood community from the era of the 1920s is the John and Lucy Mackey home. Their wood frame home was burned to the ground during the riot, but they were able to rebound from the loss and build this fine brick home on the same lot in 1926. 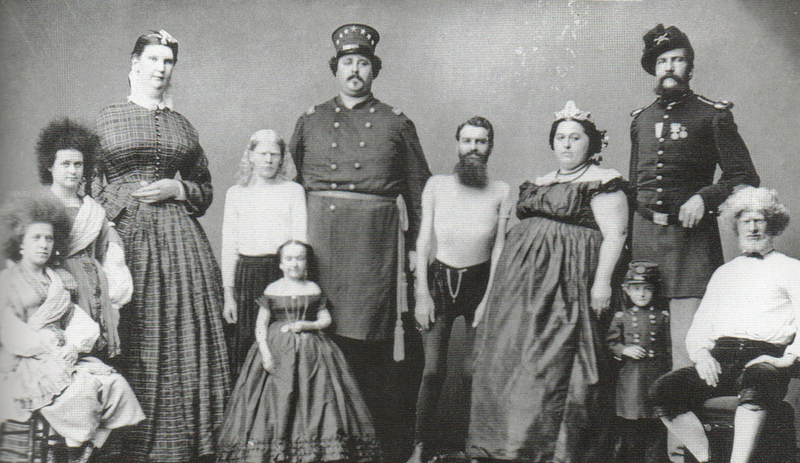 Amazingly, the Mackey’s were not “wealthy” people at all…they did domestic and yard work for white Tulsans. The home was for decades a source of pride for the local black community. 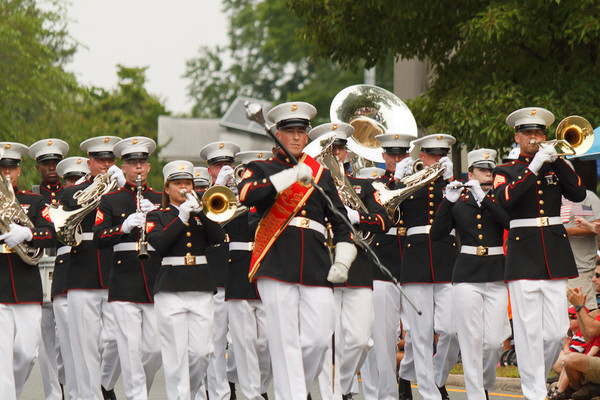 In 1995, it was incorporated into the plans for a new cultural center located in Greenwood. The Greenwood Cultural Center, dedicated on October 22, 1995, was created as a tribute to Greenwood’s history and as a symbol of hope for the community’s future. 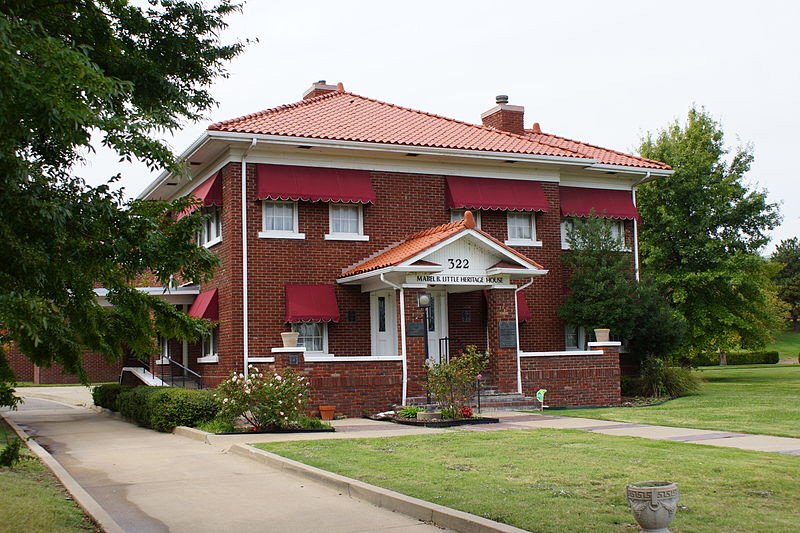 The center has a museum, an African American art gallery, a large banquet hall, and housed the Oklahoma Jazz Hall of Fame until 2007. The total cost of the center was almost $3 million. [Paid for by a federal “Model Cities” program grant.] The cultural center is a very important part of the reconstruction and unity of the Greenwood Historical District. The center has provided programs in drama, dancing, music, and the arts for disadvantaged youth in the area for many years. It’s one of the main places preserving in a museum setting the story of the Tulsa Riot—and telling the inspiring story of how much the black community HAD accomplished against the odds back in the period before the Riot. It has served as a gathering place for current residents. But from what I’ve seen on the Internet, it looks like they may lose their battle to remain open. The flurry of activity around the time of the Riot Commission’s report that led to so much publicity also led to a couple of the main textbook publishers in America adding at least a perfunctory mention of the Riot in their high school history texts. And a number of groups have produced educational resources and materials for teachers who would like to include a “unit” in their social studies or history classes on the topic. Other than that, I’m convinced that the story of the Riot is mostly going to just slip into the mists of history in the coming years. It doesn’t fit with the standard patriotic narrative. The patriotic narrative *I* would like to see is one where the noble citizens of our country own up to the darkness in parts of our corporate past, truly and publically repent of the factors that caused the darkness… and the factors that caused the “cover ups.” And then seek true reconciliation among all races as we move together to create the noble nation envisioned by our founders. Where all men truly ARE able to live in a way that reflects their “inalienable rights.” Where FDR’s “Four Freedoms” (from want and fear, for religion and speech) were actually a reality, and we didn’t have to make excuses why… they haven’t been. I still have hopes that this country could come much closer to living up to the aspirations of its founders. But if we keep ignoring our past, keep lying to ourselves and others about that past, keep mis-diagnosing our current maladies as having nothing to do with that past, I certainly can’t judge how much hope I ought to have in … those hopes. This entry was posted in lynching and tagged 1921, greenwood, lynching, Pam Dewey, tulsa riot. Bookmark the permalink.